So as is traditional (at least for the past two years), it is time for me to reflect on the past year and offer a few hopes for the coming one. Last year I reflected on a hard year in 2015 and hoped for an easier one in 2016. I doubt many people would identify this past year as such, and the political and international situation looks bleaker than it did 12 months ago. But at a personal level, this has been a year that, even if not noticeably easy, then at least an improvement on the previous one. Both my parents are still ill and neither will ever rid themselves of their respective conditions, but somehow we have come to some sort of accommodation that makes the day-to-day manageable, most days. This is life, not crisis. Similarly, the managerial work that felt so frightening two years ago has become less overwhelming as I have become more familiar with it. It is still labour that I am less secure with than, say, writing a book, but I am slowly discovering my own capability for this role, which makes things easier. And there have been some triumphs. My husband got himself a new job, which he will take up in a couple of months. This brings many positives and a few potential problems, but it is definitely a step in the direction that he wants to go. My daughter started on the great intellectual adventure that is formal schooling. In the column marked ‘unadulterated joy’, my sister got married and my brother introduced us to his new partner. The Men, Women and Care project is properly off the ground (including its very own website and blog!) and definitely going places, places which offer their own challenges but are hugely exciting. The team I have recruited is, so far, living up to their promise and doing interesting and creative work. There have been a few (small) funding successes, to balance out the inevitable failures. And, above all, I finally got my book proposal off to a publisher and it has been accepted! Which is why this year, more than most, feels unfinished. So much of the positive has not be the culmination or completion of hard work, whether personal or professional, but baby steps along the journey. So I will enter the new year with papers to write, books to read, a major project to work on, including pursuing new theoretical and methodological angles which I hadn’t considered before this year, a few smaller projects (including two conferences) to organise, and, of course, a book to complete. On the domestic front, there are still carpets to be laid, decisions to be made about renovations, and the tantalising potential of a house move that has been under discussion for the past year. The children continue to grow, physically, emotionally and mentally, challenging me as a parent as they do so. There is a lot to do, but I will go into the new year with some lessons learned – about my own ability to recover from the personal paralysis induced by major political crises, about the importance of flexibility and my own capacity to accommodate the unexpected, about how much I can do, how much I rely on others to lend a hand or ear – and just how many wonderful friends and colleagues I have who do just that. Some things, I hope, will come to fruition in 2017. Others will carry on carrying on. Whatever the new year brings, however, I am approaching it, once again, in hope and more energy than last year. Finally, it has been a year when I have turned more than usual to poetry as a source of consolation, primarily Auden and Frost, who I can probably say with some confidence are my favourite poets. So I will leave you with a poem appropriate for this point in the year, as the temperatures tumble and cover the world in frost crystals, if not necessarily snow, making my first run after a 5-month hiatus due to planter faciitis, a thing of sparkling wonder and promise. It is, as it happens, the first poem I was ever conscious of memorising as a child. Wish you and yours a year of promises kept and fulfilled and miles travelled safely, however near or far the ultimate destination. Happy New Year. A couple of publicity (self and otherwise) notices. 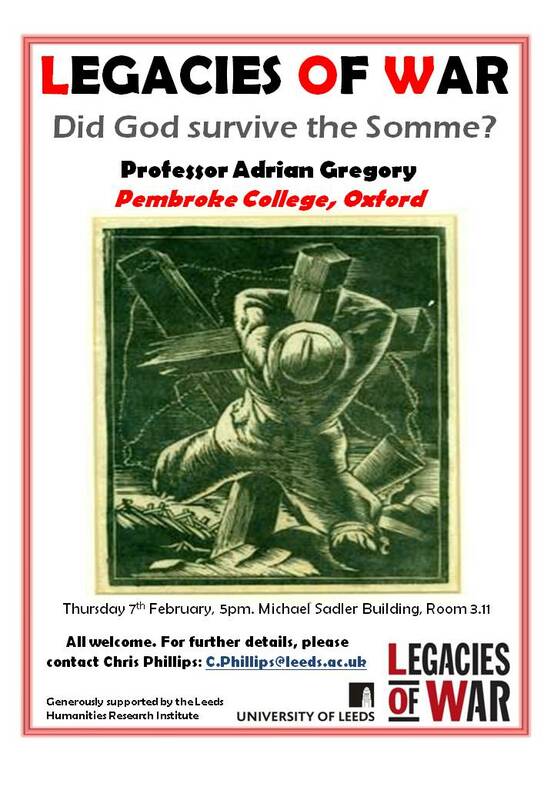 The University of Leeds Legacies of War seminar series is delighted to announce that Professor Adrian Gregory will be giving the first paper of the new term on Thursday, 7th February at 5:00 in Michael Sadler Room 3.11. He will be speaking on the topic of ‘Did God Survive the Somme?’ All are welcome. My review of Leo van Bergen’s Before My Helpless Sight: Suffering, Dying and Military Medicine on the Western Front, 1914-1918 appears in the latest edition of First World War Studies which also includes several interesting-looking articles. I should be reading about the establishment of the Territorial Army in Britain, but I think I may take break and read about Old Etonians, demographics and eugenics instead, courtesy of Richard Carr and Bradley W. Hart.